Plague! 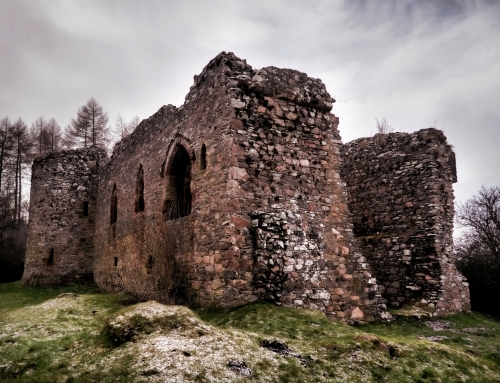 What could be a more chilling, bloodcurdling cry in Scotland during medieval times? Not even advancing armies could inspire such dread as the approaching doom of Bubonic Plague or ‘the Black Death’. The best ghost stories always involve dark deeds and dreadful deaths and it is small wonder that Edinburgh is said to be one of the most haunted places in all the world. After all, Edinburgh has had more than its fair share of gory killings and horrific demises and abounds with hideous tales such as plague-ridden children being bricked into a nursery with their distraught mothers on what is now the site of the Museum of Childhood. Other stories tell of tenements such as Mary King’s Close being bricked up to prevent the spread of the Black Death. Where there are tales of the Black Death there are also tales of restless spirits! However, the origins of the Black Death began in a land far away from Edinburgh, a land that would seem exotic in comparison to the cramped life in the smoke-bound Scottish capital which was to be given the epithet ‘Auld Reekie’. Plague is caused by a bacterium known as Yersinia pestis. Its natural reservoir is found amongst the populations of great gerbils, long tailed ground squirrels and Altai marmosets of China and the Russian steppes. The rodents are immune to the plague and have a cyclic population which means that the numbers of rodents explode to unsustainable levels and then crash as they run out of food or some other limiting factor in their environment. As the rodent numbers rise, there is a corresponding rise in the fleas that feed on the rodents. When the rodent numbers plummet, the fleas then move on to other host species which are not immune to plague, including rats, domesticated animals and humans. Once a rat is infected, a cycle begins which results in the spread of plague. Rat fleas become infected with plague bacteria. Proteins produced by the bacterium cause a biofilm or an aggregation of bacterial cells to form in the valve which connects the flea’s midgut to the oesophagus or gullet. This prevents the flea’s blood meal from entering its stomach. A mass of clotted blood and bacteria forms, known as Bacot’s block. The flea desperately tries to feed and in so doing regurgitates infected blood on to its host. In its biting frenzy it will jump onto other hosts, spreading the disease. The disease is well- equipped to perpetuate its transmission.Once in its host’s body, the germ gets phagocystosed or engulfed by a large white blood cell called a macrophage. Macrophages typically destroy most germ cell but the Yersinia cells have a virulence factor which gives them the ability to resist destruction in macrophages. The macrophage promptly carries the germ through the lymph vessels to a lymph node where the germ frees itself from the macrophage. It then begins to grow into the characteristic large black boils or buboes which gave bubonic plague its name, the Black Death! However, if the host is unlucky the bacteria may enter the blood stream rather than the lymphatic system. Here is causes a form of sepsis or blood poisoning resulting in haemorrhaging and necrosis resulting in a blackening of the skin. In this form, the disease is known as septicaemic plague. If you were extremely unlucky you could develop the most aggressive of plague variations, pneumonic plague, where the germs enter the lungs and begin to multiply. This form of plague can be spread from person to person through inhaling infected droplets and flea vectors are not required as part of the transmission cycle. 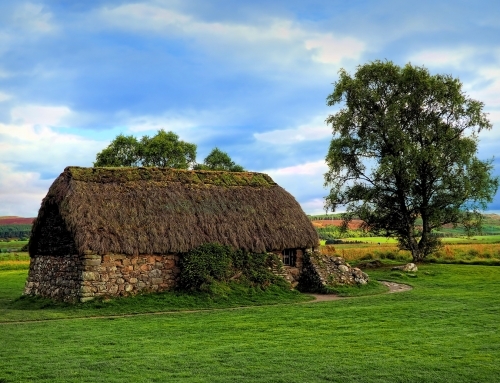 Of course, Scotland being cold and wet, produces the best conditions for the spread of pneumonic plague and allowed it to be spread in winter when the bubonic and septicemic forms were less prevalent. 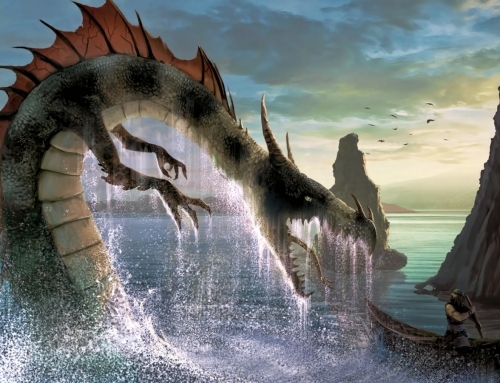 On an island and miles from its source, Scotland, it would seem, would be safe from this scourge, but fate had a different plan in mind. In 1334 plague broke out In China. From there it spread to India, Persia, Syria and Egypt along the Silk Road, the great trading network that linked the East with the West. The final leg of the trading routes culminated in Crimea on the Black Sea. From here silk, spices and other exotic goods were shipped by Italian merchants to western Europe. In 1347, twelve Genoese trading ships docked at the Sicilian port of Messina. Those who gathered to meet the ships were greeted with a horrific surprise: most of the sailors on board were dead and the remaining few were gravely ill, suffering from a strange disease which had them covered in black boils that oozed blood and pus. The ‘Death ships’ were hastily ordered out of the port, but it was too late. No doubt the fleas which had killed their rat hosts had jumped ship and found new hosts to live upon and established themselves in the local black rat population. Thus, the pandemic spread across Europe killing over 20 million people during the next five years. Some said that it was a punishment from God and others blamed the Jews and so began a frenzy of piety, self-flagellation and ethical cleansing. Cats were also blamed for causing the plague and the very means of controlling the rats with their accompanying fleas, were put to death. Cows, goats, sheep, pigs and chickens were also affected by the disease and famine followed in the plague’s wake, further weakening the already fragile. 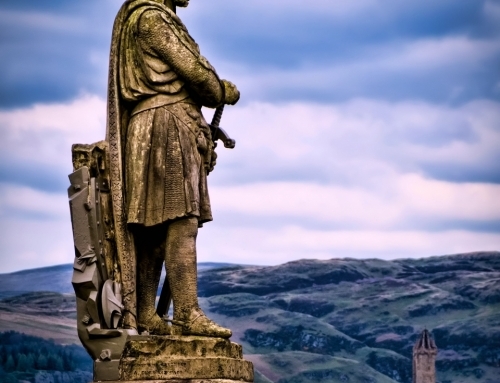 “In 1350, there was a great pestilence and mortality of men in the kingdom of Scotland, and this pestilence also raged for many years before and after in various parts of the world. So great a plague has never been heard of from the beginning of the world to the present day, or been recorded in books. “For this plague vented its spite so thoroughly that fully a third of the human race was killed. At God’s command, moreover, the damage was done by an extraordinary and novel form of death. 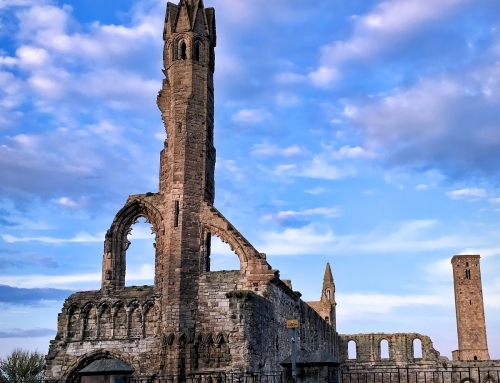 Plague was to return to Scottish shores intermittently between the 14th and 15th Centuries. 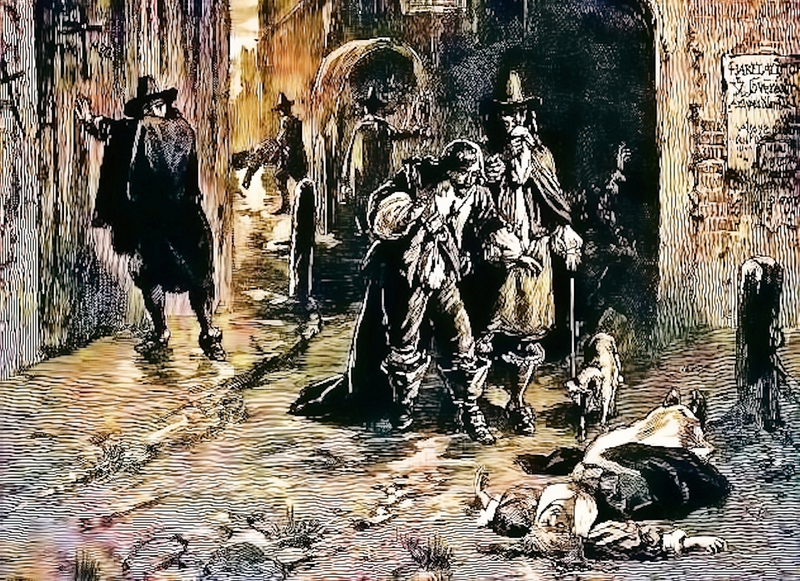 Perhaps one of the best recorded outbreaks of plague occurred in 1645. Plague arrived at the port of Leith at Christmas, 1644. It soon spread through the Scottish capital. Edinburgh by now, had built the Flodden Wall which ringed the city, after the disastrous Scottish defeat at the Battle of Flodden and had dammed the north side of the city with what became known as the Nor’ Loch. With no further room for the city to spread and with the Nor’Loch becoming a receptacle for Edinburgh’s effluent, rich and poor lived together in claustrophobic squalor and every inch of ground was filled with towering structures. Under these fetid conditions disease was rampant, and plague spread like wildfire. It was during these times that tales were told of the inhabitants being entombed alive in Mary King’s Close to prevent plague from spreading. This has now been debunked as being an urban myth. However, plague did indeed break out in the close killing some 600 inhabitants which was somewhere between about fifth and half of the residents in the close. One of the residents was John Craig who became a grave digger at Greyfriars’ Churchyard, on 27th June 1645, digging mass graves for the victims of the pestilence. A month later he was dead, and his wife and three children put into quarantine at Sciennes, an area outside the city walls. Today the City Chambers sit on top of the remnants of Mary King’s Close, all that is left being an eerie network of tunnels and cellars. Entering this underground world feels like taking a step back into the past. There is writing on the walls left behind by those inhabitants of yester year. It is small wonder there are tales of hauntings and ghostly apparitions and talk that this is one of the most haunted places in Edinburgh. People bring dolls and other gifts to the Close to leave for the spirit of a small girl that is said to haunt its walls, but she is not alone and for over three hundred years stories have been told of hauntings and bizarre visitations from the dead in this former habitation. Another tale, from the same era, focuses on a nursery on the Royal Mile. Some of the children showed symptoms of the plague. The cry got up and the mothers raced to discover the City Councillors and Foul Clengers (Plague Cleaners employed by the Burgh Council to clean out plague houses) outside the nursery. Finally, after demanding entrance, the women were allowed inside, knowing that they would never see the light of day again. Once all were inside, the Burgh Councillors gave the order to have the door bricked up. Time has passed, and it is hard to say how much truth there is to this tale but today, the Edinburgh Museum of Childhood is built on the site of the old nursey and the area is reputed to be haunted by the voices of crying children. Being a Plague Doctor was a lucrative business during the time of plague. It was a dangerous occupation and these men wanted to be suitably recompensed for their endeavours. These doctors were distinctively dressed in long leather cloaks, large brimmed hats and grotesque beaked masks filled with sweet-smelling herbs. Doctors believed the herbs would repel the “evil smells” or “miasma” which were thought to carry the contagion. The herbs did little to protect these physicians but the leather coat, on the other hand, was a great defence against flea bites. 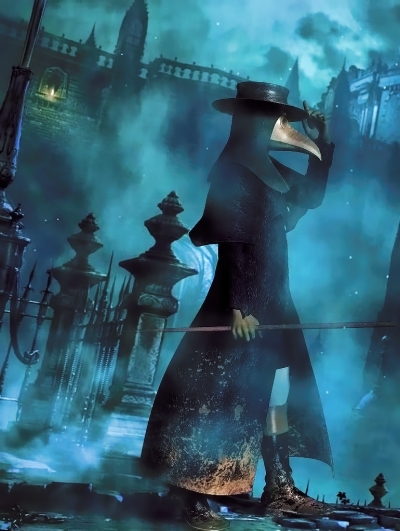 During the 1645 outbreak of plague, the first plague doctor employed by the Burgh Council was John Paulitious, who promptly succumbed to the illness. His successor was George Rae, who demanded the extravagant salary of £110 per month for his services, a small fortune for the time. These were desperate times so the Burgh Council agreed, secure in the knowledge that Rae would follow in the footsteps of his predecessor and die of the pestilence. Alas the doctor survived and the Council unwilling to cough up such a large sum of money, reneged on their promise. Fortunately, we have more knowledge about hygiene and about how plague is spread today. It is still endemic in parts of the world, but we now have antibiotics to cure those infected by this horrific disease. However, there is a part of me that wonders if one of the ghosts walking the streets of Edinburgh might be George Rae, intent on getting his revenge on the Burgh Council!